ISBN: 9781567653236 ISBN10: 1567653235. Written by: R Steiner. Softcover, 740pp, 3rd Edition. 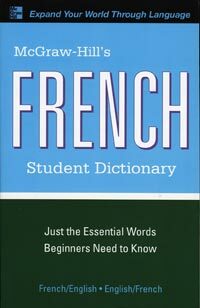 This fully revised and expanded dictionary contains over 85,000 entries and definitions, tables of French regular and irregular verb conjugation, a grammar section, a pronunciation guide and conversion tables of measurements, temperature, tire pressure, and clothing sizes. ISBN: 9780061962998 ISBN10: 0061962996. Hardcover, 2,142 pp. The unabridged addition provides accurate and reliable coverage of contemporary vocabulary and usage and is the most up-to-date and authoritative single-volume French-English dictionary available today. Over 300,000 entries and 550,000 translations include coverage of business, politics, medicine, and technology. An updated Language in use section places emphasis on everyday spoken and written language. ISBN: 9780764102790 ISBN10: 0764102796. Written by: G Lipton. Softcover, 455 pp., Illustrated. A beginner's guide in words and pictures: with approximately 1,400 words and their translations, pronunciation and a sample sentence, this illustrated dictionary is perfect for beginning students. Includes irregualar French verbs and various thematic subjects as well as nearly 200 illustrations. ISBN: 9780071440691 ISBN10: 0071440690. Softcover, 522pp. For school and workplace, this updated dictionary provides overage of the basic vocabulary of both languages, including idiomatic expressions, slang, colloquial language, literary terms and terms from specialized fields. ISBN: 9780071814454 ISBN10: 0071814450. Softcover, 832 pp.. You will always know the right word thanks to this bestselling bilingual dictionary, now revised and updated. With more than 120,000 translations, as well as colloquial and idiomatic language, French verb tables, grammar and a conversation guide, this dictionary has you covered. ISBN: 9782035700018 ISBN10: 2035700019. Hardcover, 1248 pp. A concise dictionary ideal for the student, traveler or business person, who needs an easy-to-use sophisticated dictionary. Indispensable coverage of grammatical construction, idioms and pronunciation, guide the reader in proper usage. This new edition includes abbreviations, acronyms, proper nouns, and technical and scientific terminology.